Let’s be honest with ourselves: almost nobody wears tailored clothing on Memorial Day, which is a day generally dedicated to backyard grills, beer at noon, and a swimming pool or a beach if you’ve got one. I could sit here and tell you that you needed to wear a seersucker blazer, and you’d be like, “Cool, but what happens when I drop my burger on myself?” Frankly, you’d have a point. If we’re being even more honest with ourselves, let’s admit that we’re all most likely to end up in our most comfortable shorts, an acceptably clean shirt, and maybe a snazzy apron if we’re cooking and also really trying hard. 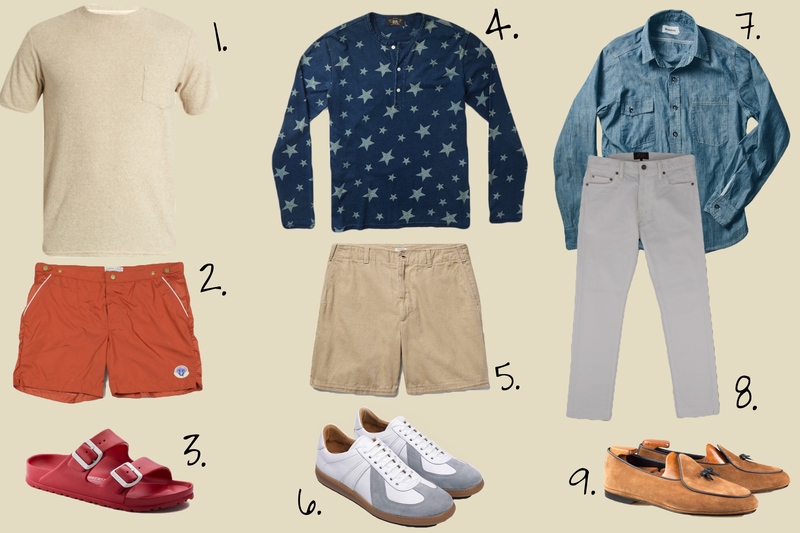 A few weeks back, I made some suggestions for packing for the long weekend, and with the realities of life in mind I’m going to re-up on those recommendations by laying out some suggestions that you might actually wear. You’ll note that all of the items – 9 in total – can be mixed and match to your heart’s desire. First, if you’re going to a pool/beach/waterpark/slip ‘n slide, opt for a pair of swim trunks that make you look like a grown up. That means that they’re not actually running shorts (I mean, I’m guilty of that), and that they have some pockets so that you’re not carrying around everything you own like an idiot and/or losing it in the pool/ocean. Second, there’s a good chance that you’ll want a pair of pants or jeans with you, wherever you are. Your festivities will probably last until the sun goes down, at which point you’ll be happy to have something to wear to counter the late spring chill. Third, if you want to wear leather-soled shoes, go for something lightweight and flexible. Like, say, a pair of loafers. That way you can wear them with your shorts or your pants, and if you are headed to a place where you might not want to wear sneakers, loafers offer a casual alternative to laced shoes. None of that means you can’t look nice, of course. Swap the aforementioned ‘comfy shorts’ for something a little sharper, put on a henley as opposed to a gym tee, and wear white jeans just because it’s summer and you can and you’ve got all year to wear your other, blue-er ones. My only other tip? Don’t wear anything tight. After three beers and two burgers (and innumerable handfuls of potato chips), you’re not going to want anything – shirt or trousers – to be tight around your waist. Enjoy the long weekend, and stay safe!